Background: The abuse of new psychoactive substances or NPS has been dramatically increasing all around the world since the last half of the year 2000 and has become a serious public health problem. NPS are a challenge for the worldwide forensic community due to the difficulties to accurately document the cases. The N-benzylmethoxy (NBOMe) group is a new class of hallucinogenic designer drugs and has gained importance in recent years. 25I-NBOMe (2-(4-iodo-2,5-dimethoxyphenyl)-N-[(2-methoxyphenyl)- methyl]ethanamine) is an analog of the 2C series of psychedelic phenethylamine drugs that contain an N-methoxybenzyl substituent, which significantly affects their pharmacological activities. It is a potent agonist of 5-HTA receptors and a severe hallucinogenic drug, with numerous irreversible psychedelic effects which can last from 5 to 10 hours. It is consumed most often in the form of drops or blotters by the transmucosal, sublingual or intranasal routes. The active dosage is very low, supposed to be less than 100 µg. The literature is poor in reporting cases where 25I-NBOMe was identified. Only very few clinical cases of overdosages were published, suggesting a low prevalence of this compound. Methods: We present a retrospective demonstration of 25I-NBOMe acute poisoning with dramatic outcome, using hair analysis. 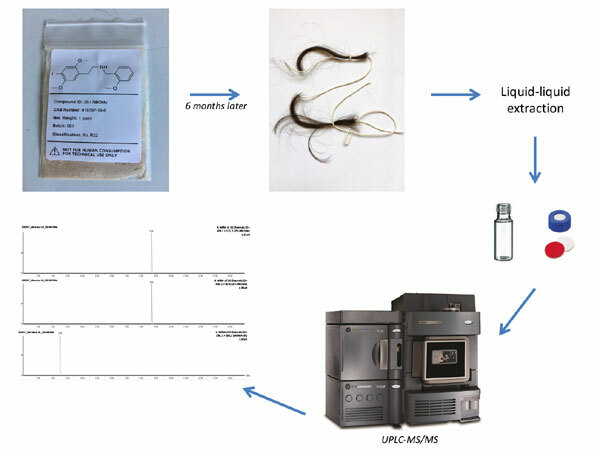 Two hair strands, measuring 9.5 cm, were collected 6.5 months after drug consumption during a forensic clinical evaluation of brain dysfunctions after cardiorespiratory arrest and were analyzed by ultra-high performance liquid chromatography system coupled to a tandem mass spectrometry (UPLC-MS/MS) and using two specific transitions: m/z 428.1 > 121.2 (quantification) and 428.1 > 90.6 (confirmation). Hair strands were segmented to determine the historic pattern of drug use and differentiate a single exposure from a chronic exposure. The hair test result for 25I-NBOMe was the following: not detected (0-2 cm), not detected (2-4 cm), 1.0 pg/mg (4-6 cm), 4.9 pg/mg (6-8 cm) and not detected (8-9.5 cm). Result: The result of the segment 6-8 cm coincides with the date of consumption (calculated with a hair growth rate at 1 cm/month) and the low concentration detected in the segment 4-6 cm probably corresponds to the contribution of dormant hair. The toxicological significance of the measured concentrations is difficult to determine because this is the first case dealing with hair analysis for 25I-NBOMe. Conclusion: The use of hair analysis for NPS is still at the initial stages. In particular, little is known about the incorporation into the keratin matrix after intake and the correlation between dosage frequency of use, and hair concentrations. Under these circumstances, NPS hair analysis should be cautiously interpreted by experienced forensic toxicologist. Keywords: Hair analysis, NBOMe, new psychoactive substances, 25I-NBOMe, UPLC-MS/MS. Keywords:Hair analysis, NBOMe, new psychoactive substances, 25I-NBOMe, UPLC-MS/MS. Abstract:Background: The abuse of new psychoactive substances or NPS has been dramatically increasing all around the world since the last half of the year 2000 and has become a serious public health problem. NPS are a challenge for the worldwide forensic community due to the difficulties to accurately document the cases.